The Partiologist: How to Stamp on Cookies! How to Stamp on Cookies! Moving right along with my royal icing kick, I have become addicted to stamping on cookies. While this may not be the first time you've seen stamped cookies, it is the FIRST time I've stamped and there's no turning back. 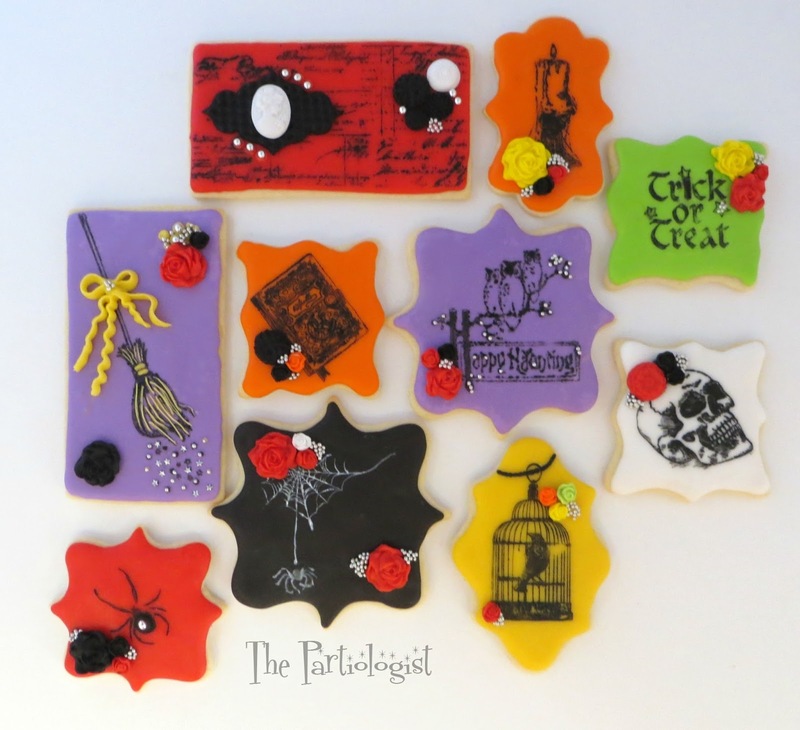 With my newly purchased stamps, I created a vintage set of Halloween Cookies. 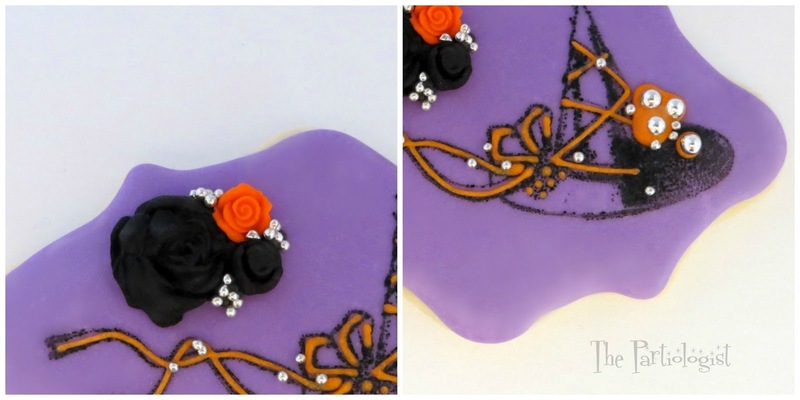 With a bit of imagination, you can create a vintage set of Halloween cookies. Stamps, fondant molds and silver dragees (not shown). Remember, there are no rules. Kinda like Outback. Bake an assortment of cookies that your stamps will fit. I chose different sizes of plaque shapes and used bright colored royal icing. If you like, stamping on fondant is also an option, just cut the fondant to fit the cookie. Stamp the fondant before placing on cookie. First up is the spider web. Paint white food color on the web, make sure it is completely covered. Turn the stamp over and stamp on the cookie just like you would stamp on a piece of paper. Carefully lift the stamp off the cookie and whoop, there it is! Wash the stamp with soap and water, completely dry. Paint the little spider and stamp it on the cookie at the bottom of the web. Next, I painted black food color on the cage stamp. Press the stamp on the cookie and carefully lift off. Are you having fun yet? I sure am! Continue stamping all the cookies, any color, any stamp! To add more of a vintage look, I made fondant roses in different sizes and added to the cookies. Remember - click on the photos to enlarge. Before adding the roses to the cage, I piped a little rope border across the top. Add a little drop of icing to the sides of the roses and sprinkle with silver dragees. More roses, dragees and fondant décor.I piped additional frosting to the top of the broomstick, and on the broom. Added more silver dragees and silver stars. More added detail on the witches hat. 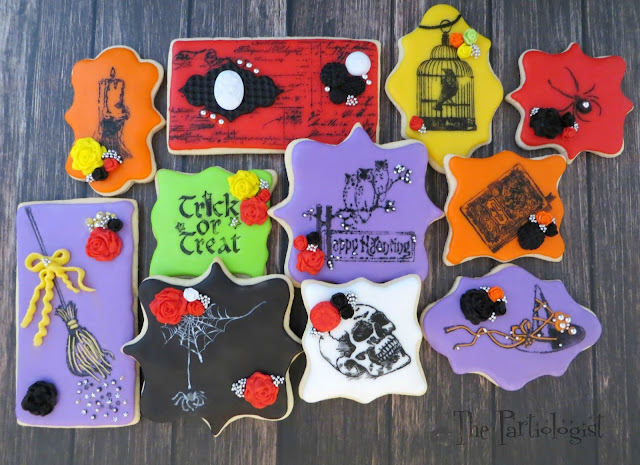 My woven web of stamped Vintage Halloween Cookies! These are amazing. Can I ask if these stamps are bendable? I tried stamping but I guess because of unevenness only certain parts stamped on my cookie. Mine have the wood block attached so I couldn't push it down in all areas. Does this make sense? Looks like theses are just the rubber. Can you tell me if they are just rubber and plyable? Yes, it makes total sense! All the stamps were bendable, the only one that wasn't was the Trick or Treat one, it had a wooden back. Since they were bendable, it was very easy to apply more pressure where needed if the cookie wasn't completely flat. Hope this helps! I am in love with these cookies and technique! FABULOUS!!!!! Just about...I must confess, I ate one! LOVE!! I bought some stamps last year when they were on sale so I could stamp on some cookies. You make it look so easy and I can't wait to do it! Thanks for the tutorial! I used to have hundreds of stamps years ago and sold them when I moved. I sure wish I had kept them!! You are amazing! I love everything you post!!! Well, I love every time you comment!! Thank you so much Marilyn, you're so sweet to stop by!